Quick and easy height adjustments. Height range: 260–420 mm. 2-pack. Prevents dents and buckling. 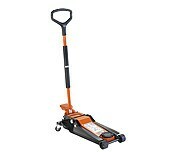 Fits both trolley jacks and axle stands.